Each tab contains 10 mg of Chlorodehydromethyltestosteronum. Protein synthesis disorders, diverse genesis of cachexia, trauma, extensive burns after irradiation infectious diseases, muscular dystrophy, osteoporosis, negative nitrogen balance corticosteroid therapy, aplastic anemia and hypo. Turanabol as prepared predominantly with anabolic effect, can be indicated as adjunctive therapy in cases of protein catabolism with negative nitrogen balance (deficiency, excessive consumption or loss of protein) in the elderly with denutrition status and cachexia, in asthenia, cachexia different origin in combustion vast and bedsores, after surgery, infections and major trauma, osteoporosis, continuous use of glucocorticoids , and aplastic anemia; hemolytic anemia, chronic anemia, chronic renal failure, anemia caused by tumors, lymphomas and leukemia, idiopathic thrombocytopenia, muscle atrophy in patients with AIDS in pediatric practice in case of increasing retention, anorexia (lack of appetite), weight reduction, etc. Hypersensitivity to the drug, adenoma of prostate cancer, male breast cancer, breast carcinoma in women with hypercalcemia, ovarian cancer, CPI, severe atherosclerosis, nephritis, nephrotic syndrome, renal and hepatic dysfunction, acute and chronic prostatitis, pregnancy, lactation period until sexual maturation. The therapy with anabolic steroids is adjuvant and cannot be a substitute for the basic treatment. Turanabol treatment length depends on the patient's response and the development of possible side effects. Adults: The response to the anabolic steroids is varied. 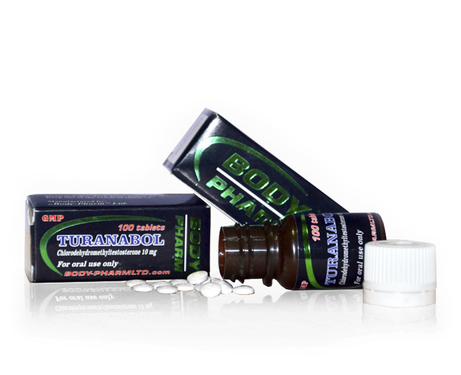 Turanabol dose for adults is 20-50 mg daily. Duration is considered appropriate for a cure for 2-6 weeks. Turanabol as androgenic and anabolic steroids, penetrates cell membranes and interact with cytoplasmic receptors and the complex formed is transported into the nucleus where it acts on specific nuclear receptors. Active complex binds to DNA and acts as a transcription factor that determines the synthesis of RNA and specific proteins. Turanabol manifests predominantly anabolic effect which is particularly evident in striated muscles and bones, and other tissues with high division (bone marrow, mucous etc.). The drug causes primarily increased muscle mass and growth rate (less effect as testosterone, but can be amplified using other anabolics). Contributes to bone calcium fixation in bones, possibly due to increased matrix protein formation and / or reduction in parathyroid hormone responsiveness of bone tissue. A key contribution lies in achieving anabolic metabolic changes: a positive nitrogen balance (nitrogen retention), increased protein synthesis, decrease catabolism of amino acids, phosphorus and potassium retention. The drug stimulates hematopoiesis, especially erythropoiesis (erythropoietin formation increases) and favors leucopoiesis and platelet formation. When prescribing anabolic steroids patients should be informed about possible side effects, and they should address with their doctor immediately at their occurrence. At the first signs of virilization of patients (deepening of the voice, hirsutism, acne, clitoromegaly) administration should be stopped to avoid irreversible changes. Preparations of this group can cause suppression of plasma coagulation factors II, V, VII, X this requires careful supervision, including concomitant use with indirect anticoagulants. During treatment it is necessary to monitor liver function parameters (transaminases, alkaline phosphatase, and bilirubin) and lipid (cholesterol and low density lipoproteins). In the elderly it can be seen an increased incidence of hypertrophy and prostate carcinoma that requires close monitoring. In children anabolic steroid use requires caution because they may accelerate epiphyseal closure, effect that may last for 6 months after suspension. For these reasons it is recommended to consult with specialists about rationality preparation using, following radiological bone maturation control. In patients using high doses of anabolic steroids needs periodic determination of hemoglobin and hematocrit due to possible polycythemia. Liver disorders: cholestatic jaundice, rare hepatocytes with hepatic necrosis, hepatocellular neoplasms. It can change the biochemical parameters: increase the level of bilirubin, alkaline phosphatase, transaminases. Cholestatic jaundice may develop after 6 weeks or more of treatment (home is considered as toxic) and is manifested by hyperbilirubinemia bile stasis in the capillaries and increase alkaline phosphatase content. Prolonged use for many years may increase the frequency of liver tumors. Endocrine disorders: Turanabol rarer than other anabolic steroids in men can cause: reduced spermatogenesis and sexual potency (secondary to decrease gonadotropins and testosterone secretion with testicular atrophy and oligospermia) prostate hypertrophy (mainly in elderly patients), epididymitis, chronic priapism. In boys may cause early sexual maturation, frequent erections, increasing risk of growing retention. Neurological disorders: excitation, insomnia, depression, confusion. Miscellaneous: during puberty may close early epiphyseal areas with increased retention.